Next week heralds the beginning of March and with it the start of the meteorological spring. It's a time that all keen gardeners look forward to. Finally the time has arrived to start getting the garden in shape and plan for bountiful year. There's lots to be done and here's some jobs to keep you occupied. General clear up – Even of you have no big plans for your garden this year a good tidy up will make all the difference. Pick up any fallen leaves and discard any old or dead plants. Do repairs – Hopefully the March winds won't be too strong this year but winter can have a devastating effect on the garden. Mend fences, replace greenhouse panes and tie up any plants or trees that have broken free of their posts. Check the soil is ready for planting – March can be kind or cruel weatherwise. If your soil is ready for direct planting of seeds depends if the soil is warm enough. Soil that isn't ready will feel cold to the touch and clammy in your hand. Seeds planted in cold soil will struggle to germinate and the roots won't grow. Soil that feels warms and holds together when squeezed but can still be crumbled is perfect. Prune shrubs – Spring flowering shrubs such as Lonicera, Ribes and the cheerful yellow-coloured Forsythia can be pruned after the flowers have faded. Next year's flowers will develop on this year's growth. Mow the grass – If it is dry enough give the lawn a trim. It doesn't need to be cut to its shortest but a regular trim from now on will make it much healthier in the summer. Chit potatoes – My egg boxes are all ready to start my first early varieties off. Chitting encourages shoots to grow so they can root into the ground when planted. Visit a garden – The National Garden Scheme's Daffodil Festival runs through March and April. One of the beneficiaries of the money raised by the gardens that open to the public is Marie Curie which organises the Great Daffodil Appeal each year to fund their Marie Curie Nurses. Deadhead spring bulbs – Daffodils provide a stunning spring display but to ensure next year is as good make sure you deadhead any flowers once they have died. When they have finally finished flowering leave the foliage for at least six weeks so all the energy and goodness can return to the bulb. Sow seeds indoors – If you still don't fancy venturing out into the garden start sowing indoors. Make sure you find a draught-free area to place your trays in and remember not to over water. What are your garden plans for this year? 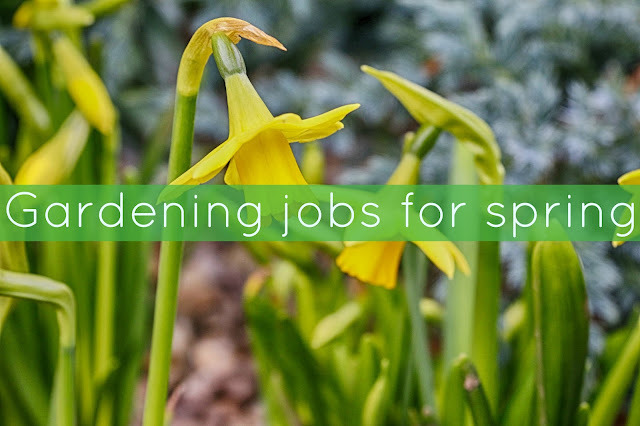 Have you thought about your spring gardening jobs?